The annual Firefighter Demolition Derby raises money for the Burn Institute, and this year Matt Newlin of the Carlsbad Fire Department was given the Hard Charger Award for raising the most money. Newlin and the other Carlsbad firefighters raised $16,250 for the Burn Institute prior to the demolition derby, which took place June 3 and was part of the San Diego County Fair. Bob Pfohl of the Viejas Fire Department, who organizes the Firefighter Demolition Derby, was the second-place fundraiser with $16,075. Other Carlsbad firefighters helped convert the 1980 Cadillac Seville into a demolition derby car. The process took about six weeks. Newlin acquired the Seville on Craigslist. In 1995 the Cajon Speedway, the Burn Institute and local fire departments collaborated for an annual night that included fundraising and promotions for the Burn Institute, a pre-race parade of fire trucks, an American flag raised from a fire engine ladder for the Star-Spangled Banner and a Firefighters Destruction Derby. The Burn Institute and local firefighters also collaborated for an annual exposition and burn run at Qualcomm Stadium. Cajon Speedway closed after the 2004 season, but in 2010 the Fire and Safety Exposition was moved to the San Diego County Fair and the Firefighter Destruction Derby (which was renamed the Firefighter Demolition Derby this year) returned after a five-year absence. Burn Institute Director James Floros contacted Pfohl, who was Santee’s fire chief when he won the 2000 Firefighters Destruction Derby, about the possibility of a firefighter demolition derby at the fair. Pfohl, who became a division chief for the Viejas Fire Department after retiring from the city of Santee in 2006, agreed to organize the event. Some changes were necessary due to the configuration of the Del Mar Arena. The parade of fire trucks takes place earlier in the day, the flag is not raised from a ladder inside the covered arena and the cars are divided into heats. This year’s format involved two early afternoon heats with the last two running cars in each heat qualifying for the final, a last chance heat in the late afternoon to allow the last three remaining cars into the concluding competition and the final itself. The driver from the fire department which raised the most money for the Burn Institute is also allowed to drive in the final if he has an operational car. Because Newlin’s car was one of the final two still running in the first heat, Pfohl was given entry into the feature as the driver who raised the next-highest amount of money. During the final the cars of Newlin and Lakeside Fire Department driver Danny Leetch became stuck and neither driver was able to move his car before reaching the time limit for stalled cars. The Carlsbad Fire Department had two cars in the demolition derby; Jeff Chumbley was in the second heat but was not able to participate in the last chance qualifier. Thomas Klein of the Camp Pendleton Fire Department drove in the first heat before his station wagon’s transmission failed and Klein also did not participate in the last chance qualifier. Escondido Fire Department representative Alex Koji advanced from the last chance qualifier to the final. Although the Rancho Santa Fe Fire Protection District did not have a car in the demolition derby, engine 2611 spent the demolition derby on the south side of the arena in case any cars caught on fire (a Pala Fire Department truck was on the north side of the arena and handled the day’s only car fire in the arena). 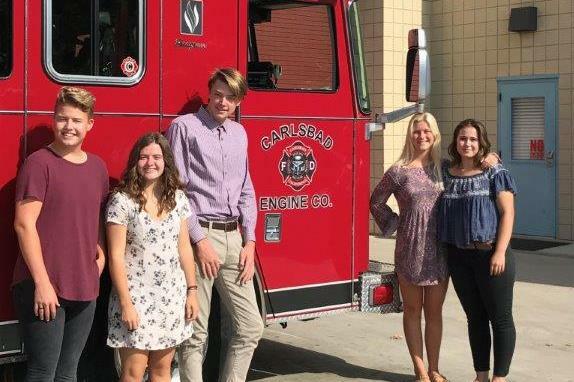 Members of the Carlsbad Fire Department’s Explorer program helped with traffic control during the parade of fire vehicles and also carried boots for donations to the Burn Institute both in the arena prior to the heats and elsewhere around the fairgrounds. Newlin has been with the Carlsbad Fire Department for 11 years and is currently based at Station 5. He was raised in Escondido, where he still lives, and worked for the Barona, Valley Center and Rincon fire departments prior to being hired by the city of Carlsbad. Newlin made his Firefighter Destruction Derby driving debut last year, although he has participated in other capacities during the years he was not behind the wheel. “It’s a great cause raising money for the Burn Institute,” Newlin said.